A long time ago, I started off coding my first handheld game on the GP2X-Wiz. I finally booted up my old WIZ a few days ago, and realized I had a game or two that was mostly finished - and never published. So, better late than never! Besides, who thought a game would get added at the end of 2016? 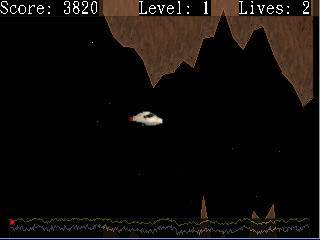 It is a simple little game, you use the arrow keys to try and stop your ship from hitting the mountains. My old site, edware.org, is long gone. And now I run FileArchiveHaven and RedIronLabs. Cheers! Note: I only have a GP2X-Wiz, not certain if this will work right. Drop a comment if it acts funny. Thanks for the new game. Would love to see more.